New Tribunal books for Ars Magica Fifth Edition are always highly anticipated, and Faith & Flame: The Provençal Tribunal is no exception. The lands of the Languedoc have been a central element of the history of Mythic Europe since the earliest editions of the game, but never before have they been so thoroughly detailed and explored. Each Ars Magica Tribunal book features one of the 13 regions of Mythic Europe, as organized by the magical Order of Hermes. Everything that players and storyguides need to know in order to tell rich and engaging stories in those regions is provided, from important personalities, rulers, and historical figures to dangerous monsters and cunning adversaries. On top of all of that, the culture, history, and geography of the Tribunal is presented in an easy-to-use reference. 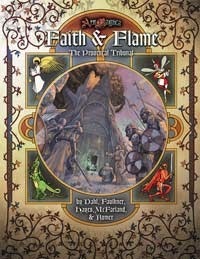 Fans of Ars Magica may uncover dozens of references to the game's past editions in Faith & Flame. The lost covenant of Val-Negra, for example, is revealed in its terrible ruined glory. Fans of magical fantasy will appreciate such monsters as the legendary Tarrasque, illustrated in this volume by cover artist Christian St. Pierre. Armchair historians should revel in the book's insight into Basque culture and folklore, to say nothing of the fallout of the Albigensian Crusade. With new rules, mystical traditions, monsters, and lore, Faith & Flame is a must-have sourcebook for any Ars Magica Fifth Edition fan.